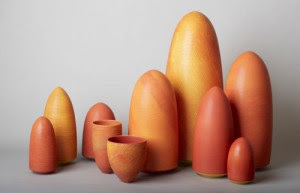 It is hard to pin down what I love more - the colour or the shape of these beautiful ceramic pieces. I think, perhaps, the colour wins out. 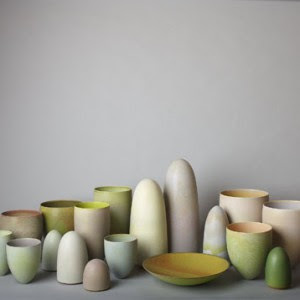 It's not hard to see that Pippin Drysdale takes her inspiration from the landscape - she was born in Melbourne but spent many years of her youth on country properties in Western Australia. More recently she has taught at prestigious universities such as Princeton in the USA. Currently she is exhibiting at the Michael Reid At Elizabeth Bay. 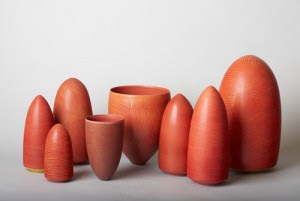 Oh, and if that's not impressive enough, her works are in collections at the National Gallery of Australia; the Museum of Modern Art in Gifu, Japan and the Museo del Ceramica, in Faenza, Italy. Which five words best describe you? Passionate, outrageous, dedicated, nurturer of the creative spirit, enjoying the journey of life. What was your first job and what path have you taken since then? In despair of me, my father, who played golf with the manager of the local national bank got me a job as a typist at the bank. I was a lousy typist, couldn’t take shorthand, and a misfit within the company. I lasted about a year and then ran off to become a hippy and set up the largest organic herb garden in WA. What’s your proudest achievement? I am a person who wakes in the morning knowing I have much to achieve and goes to bed knowing that I have achieved. 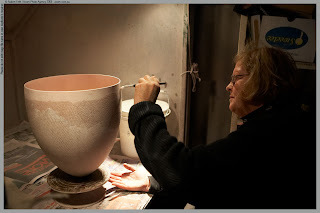 Therefore over the past 30 years I have had amazing achievements, such as being an international ambassador for Australian ceramics. What’s been your best decision? At the age of 30 the move from being a hippy with an organic herb garden to working with clay – and I’ve never looked back! What was the starting point for this exhibition? 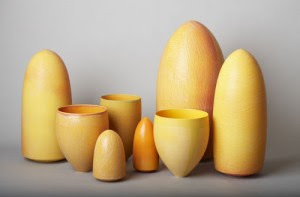 To develop a variation of form, whether vessel or closed form, to move from the single entity to topography. Who inspires you? The landscape, people in the landscape, travels and life experiences which all have a relationship to the growth of one’s personal journey. When it stops hurting you may as well give up! What are you passionate about? Life/living, journeys, my work. What’s the best lesson you’ve learnt? Never be beholden to anybody. Know your rights. Always go with your intuition (it’s the only thing you know). What dream do you still want to fulfil? To stay physically and mentally alert and fulfil my journey. What are you reading? Bad news & stock market reports and getting depressed!